Standing with those who seek a just peace. Yesterday, Commissioners at the 41st General Council of the United Church of Canada voted in endorsement of the report of the Working Group on Israel/Palestine Policy: “…the United Church has put its stamp of approval on a proposal that includes a call for a boycott of products from the illegal Israeli settlements in the West Bank” (click here). Click here to read the text of the 13 motions that were approved by the United Church of Canada’s 41st General Council regarding Israel and Palestine. Click here for an interview with Rev. Bruce Gregerson, Senior Programs Officer of the United Church of Canada, from 15 August 2012, on CBC’s Power & Politics hosted by Evan Solomon. As a next step, the General Council Executive will develop ways to identify products (e.g., cosmetics and electronics) from illegal Israeli settlements for church members’ reference. Some may suggest that the United Church of Canada took one party’s side over another. I see this decision as standing with all those, Israeli, Palestinian, and engaged citizens in Canada (e.g., Independent Jewish Voices Canada – see news releases here; Canadian Friends of Sabeel – click here) and around the world, who seek a just peace in Palestine and Israel. Standing for justice through nonviolent means. This week members of the United Church of Canada are discerning how best to ‘stand’ for justice, in response to invitations from partner organizations within Canada and globally. 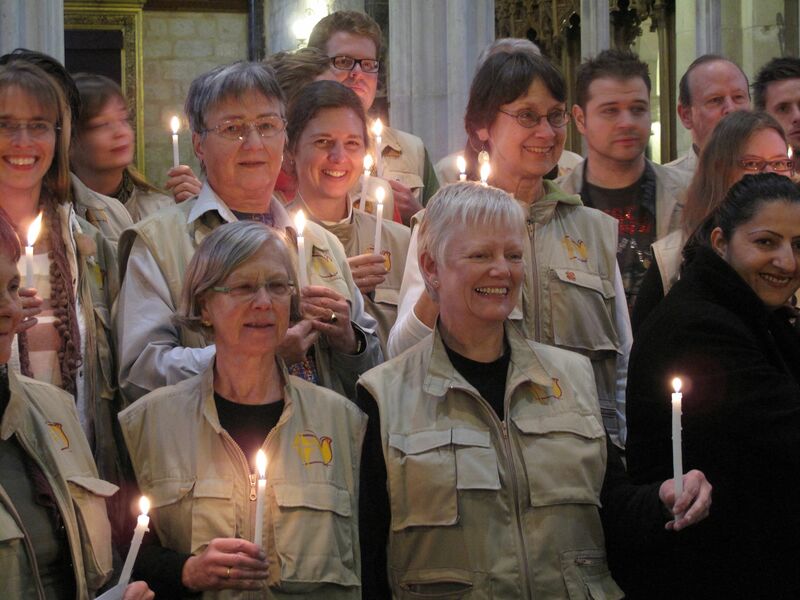 As an Ecumenical Accompanier (EA) with the Ecumenical Accompaniment Programme in Palestine and Israel (EAPPI), I choose to stand in ways that are consistent with international humanitarian law and international human rights law. One way that Canadians, collectively, might stand for a just peace in Palestine and Israel is through the boycotting of products produced in illegal Israeli settlements in occupied Palestinian territories. All Israeli settlements in the occupied Palestinian territories are illegal according to Article 49 of the Fourth Geneva Convention, which states, “The Occupying Power shall not deport or transfer parts of its own civilian population into the territory it occupies.” The Israeli government is an occupying power and it is violating international law. Engaged citizens can protest such violation through boycotting. Jean Zaru observes that, “Boycotts, divestment, and sanctions are nonviolent means for individuals, churches, academic institutions, cities, and corporations to make a difference and to highlight the need for adherence to international law and the rapid achievement of a just peace” (Zaru, 2008, p. 73). The United Church of Canada is considering an initial collective step through this boycott action of products produced in illegal Israeli settlements in occupied Palestinian territories. This would be a step that says, “no”, to economic structural violence. “Structural violence is silent. It does not show. Television captures the direct violence and most often the violence of the powerless and the hopeless, and it is headlined as terror. One basic weakness in most conceptualizations of violence in the Israeli-Palestinian conflict is the basic assumption of symmetry, which views contending parties in conflict as being equal. After all, the conflict is there because we are unequal. We are unequal in access to power, media, and influence. But we insist that we are not unequal in our rights” (Zaru, 2008, p. 62). For additional information, click here. Silent, economic structural violence (e.g., an unjust and unbalanced access to resources in occupied territories) is occurring in occupied East Jerusalem and the occupied West Bank. Through such violence, Palestinian society and Israeli society in Jerusalem are being torn apart. Ending this occupation and finding a just peace is critical for future co-existence. Jean Zaru also offers this: “As Palestinians and as women our struggle to achieve these ideals [of justice, equality, and freedom] continues today. It has been a long struggle, waged on so many fronts. It has been a long walk, and a long road to freedom still lies ahead. On the way, we often get tired, confused, and frustrated; we sometimes lose direction; we find ourselves at an impasse or headed down a one-way or a no-entry or even a dead-end. But this has not discouraged us or made us give up our journey with others and for others. In fact, the difficulties of our journey have made the issues of the struggle even clearer and have revealed to us the interconnectedness of unjust structures, the web of oppression, and the various struggles for liberation” (Zaru, 2008, p. 105). Reference: Zaru, Jean. (2008). Occupied with Nonviolence: A Palestinian Woman Speaks. Foreword by Rosemary Radford Ruether. Minneapolis, MN: Fortress Press. Click here. Here is an update from today’s debate at the 41st General Council of the United Church of Canada. Click here and here. See this commentary from last week (click here) from Stephen Scheinberg regarding the Centre for Israel and Jewish Affairs’ (CIJA) (which has succeeded the Canadian Jewish Congress) perspective on the United Church of Canada’s discussions. For additional ecumenical activity on boycotting products from illegal Israeli settlements (i.e., Israeli settlements in the occupied Palestinian territories), see this international list (below). Thanks to the United Network for a Just Peace in Palestine and Israel (UNJPPI) for forwarding this info. World Council of Churches – Voted in support of boycotting settlement products. Click here and here. National Council of Churches in Australia – Voted in support of boycotting settlement products. Click here. Presbyterian Church, USA – Voted in support of boycotting settlement products. Click here and here. United Methodist Church, USA – Voted in support of boycotting settlement products. Click here. Quakers, UK – Voted in support of boycotting settlement products. Click here. Methodists, UK – Voted in support of boycotting settlement products. Click here. Yes – Time to talk. This week, the 41st General Council of the United Church of Canada is meeting in Ottawa, Ontario, Canada. On 14 Aug. 2012, commissioners debated a report of the Working Group on Israel/Palestine Policy in the United Church of Canada. The discussion is addressing the question of boycotting products from illegal Israeli settlements (i.e., Israeli settlements in occupied Palestinian territories). Discussion is not addressing divestment or the boycott of products from Israel. In the title for this posting, I paraphrase Bruce Gregersen, General Council Officer for Programs, who was reported to have said yesterday that “the report has prompted a widespread debate on the Palestinian situation”. “This [three-hour debate] has opened up the conversation in the country. There are those who will say you should not have this conversation, that there’s no legitimacy to any conversation that would undertake any criticism of the legitimacy of the settlements,” he said. “I think what we’ve done as a denomination is to say very directly that yes, it is appropriate to talk about this and we believe it’s vital to talk about this.” (Click here.) The 11-part motion will return to the floor for discussion today, 15 Aug. 2012. A fellow Ecumenical Accompanier (EA) offered poems to we, Canadian EAs, yesterday, as we watch and wait. Thank you, Larry, for this “contemplative supplement” to the debate at General Council, readings of poems by a Palestinian living in Galilee, named Taha Muhammad Ali, and by Peter Cole: “The Place Itself, or I Hope You Can’t Digest It” and “Coexistence: A Lost and Almost Found Poem” (Click here). In response, I offer this YouTube video by a sister EA from the Jerusalem Team that followed my team in Spring 2011. In response to my suggestion to ask the young Jahalin Bedouin teen girls about the meaning of “the sea” to them, two EAs invited the girls to dream about water and the sea. In this hope-filled video (click here), they discuss in Arabic and English their dreams as they write poetry. See some of their finished poems here. For recent updates regarding the Commissioners’ discussion, please click here and here. Please click here for a response from Kairos Palestine (click here) members. Please click here for a response from Independent Jewish Voices (IJV) Canada (click here). For background information about the United Church of Canada’s Working Group report, click here. Scroll down to “Israel/Palestine Report”. Finally, for information from the recently established United Network for Just Peace in Palestine and Israel (UNJPPI), click here. Join us as we watch and wait. Talk about it within your own circles of friends, family, acquaintances, and new faces. Believe in a just peace for Palestine and Israel…and for our global home.